With an impressive growth record in this industry, we are providing a wide array of 30 N Wippee Wet Wipes. We are One of the Leading Organic Cotton Multi-Printed Baby Wipes Manufacturer in India. Being the foremost company, we are offering an exclusive array of Baby Wipes. Our offered array is famous for its attractive functions. We are enlisted amongst the reputed firms in this business and are into providing Soothing Baby Wipes to our honorable customers. These Soothing Baby Wipes can be used to clean baby’s skin while changing diaper which leaves a soothing effect on the skin. Offered products are also checked for quality before delivering. 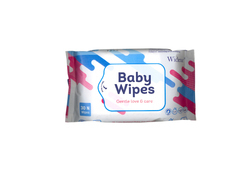 We are one of the major supplier of Baby wipes in India. It is a small moistened piece of paper or cloth that often comes folded and individually wrapped for convenience. Wet wipes are used for kids cleaning purposes. These are made using excellent quality material to make sure these are comfortable to the baby. These are offered at reasonable price by us.